Since 2006, the American College of Emergency Physicians (ACEP) has periodically released a state-by-state report card on America’s emergency care environment. In 2014, the third installment of the report card was released. “The information from ACEP’s report card provides clinicians with data on how well emergency care is supported in the United States,” says Jon Mark Hirshon, MD, MPH, PhD, FACEP, who served as chair of the task force that directed the development of the report card. According to the 2014 report card, the continued failure of state and national policies to support emergency care is endangering patients who require emergent and urgent care. Overall, the United States received a near-failing D+ grade. In a breakdown of the five categories of the report card, the nation received a D- in the access to emergency care category; a C- in the medical liability environment and disaster preparedness categories; and a C in the quality and patient safety category as well as the public health and injury prevention category. The District of Columbia ranked first in the nation with a B- grade, a mark that surpassed Massachusetts, which held the top spot in the 2009 report card (Figure 1). Massachusetts, Maine, and Nebraska also had B- grades, while Colorado rounded out the top five states with a C+ grade. Wyoming ranked last in the country, receiving an F overall. Arizona was second to last with a D- overall, while New Mexico, Montana, and Kentucky completed the bottom five rankings with an overall D grade. States continued to struggle with many issues, including healthcare workforce shortages, limited hospital capacity, ED boarding of inpatients, long ED wait times, and increasing financial barriers to care. 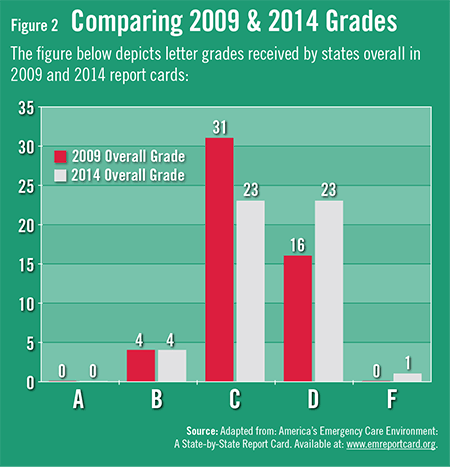 In the report card, 21 states received F’s in access to emergency care. Ten states received failing grades for quality and patient safety, the medical liability environment, and public health and injury prevention. Also, 13 states received Fs for disaster preparedness. The report notes that there were 19 more hospital closures in 2011, and psychiatric care beds and hospital inpatient beds have decreased significantly despite increasing demands. “Patients are increasingly reliant on emergency care,” Dr. Hirshon says. Other reports have noted that primary care physicians are increasingly advising their patients to go to the ED after hours to receive complex diagnostic workups and to facilitate admissions for acutely ill patients. American College of Emergency Physicians. 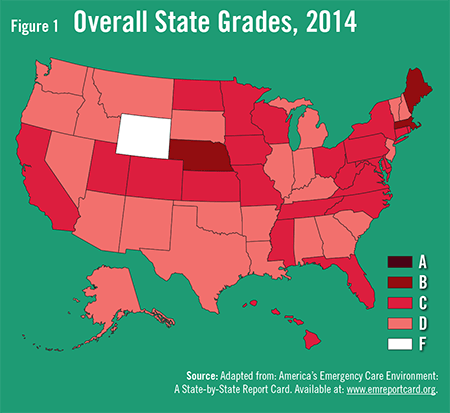 America’s Emergency Care Environment: A State-by-State Report Card. Available at: www.emreportcard.org. Epstein SK; 2010 Academic Emergency Medicine consensus conference, Beyond Regionalization: Integrated Networks of Care. Regionalization findings in the national report card of the state of emergency medicine. Acad Emerg Med. 2010;17:1349-1350. Jack BW, Chetty VK, Anthony D, et al. A reengineered hospital discharge program to decrease rehospitalization: a randomized trial. Ann Intern Med. 2009;150:178-187. O’Hara R, O’Keeffe C, Mason S, Coster JE, Hutchinson A. Quality and safety of care provided by emergency care practitioners. Emerg Med J. 2012;29:327-332. Jon Mark Hirshon, MD, MPH, PhD, FACEP, has indicated to Physician’s Weekly that in the past he was paid an honorarium to give a presentation on interpersonal skills as well as systems-based practice and practiced-base learning for Audio Digest, totally $2,000. He also has received grants/research aid from the NIH, CMS, AHRQ, and other federal and state agencies.